The success of Marr Scaffolding’s program of Installation and Dismantling (aka Erection and Dismantling and/or E&D) services is due in large part to the depth of experience found in our highly skilled E&D foremen and their crews. Averaging over 15 years with the company, Marr foremen are remarkably proficient and maintain an impressive safety record. The company’s E&D (erection and dismantling) expertise has been challenged many times over with unique building features ranging from the historic to the ultra-modern and we have met those challenges hands down. 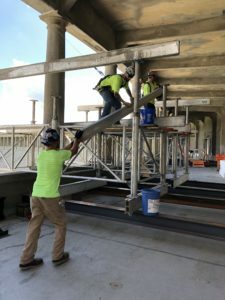 Scaffold erectors for nearly 70 years, Marr has accumulated knowledge and hands-on experience that has resulted in a cleverness for problem-solving and a strong competence in this area of construction. With each building project we encounter something new and we take away something that can be built upon for future application. E&D services are utilized with a variety of building equipment including sectional scaffolding, systems scaffolding, suspended scaffolding, Hydro Mobile mast climbers, shoring, environmental protection and temporary bleacher seating.